Healthcare technology is a market that's been on a clearly upward tear of late, taking advantage of an industry that's eager for just about any cost-cutting measure it can get while still delivering services. Improving efficiency, offering more capability, and a variety of other points tend to draw interest in the healthcare technology market. Welch Allyn, meanwhile, is preparing its new Connex Spot Monitor system for an upcoming event. 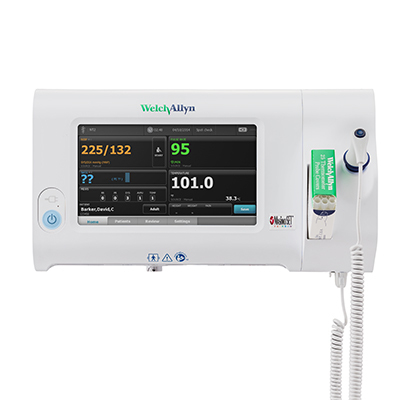 Welch Allyn will also be showing off, according to reports, the complete lineup of connected electronic vitals documentation solutions, but the Connex is likely to take center stage. With the Connex, patient documentation can be accessed from one simple touchscreen interface that both captures and transmits patient data to a larger electronic medical record, which makes for clear improvement in patient safety by supplying valuable information where it needs to be supplied. The Connex can be used on a huge quantity of patients ranging from neonatal patients all the way to adults, and can not only capture vital signs, but can be used to monitor at intervals, score according to early warning mechanisms and transfer data to electronic medical records facilities. The Connex uses the 15-second SureBP system, along with blood pressure averaging systems, the SureTemp Plus thermometer system, several different oximetry options ranging from Masimo to Covidien, and even several customizable fields including patient responsiveness and pain level. It's been 510(k) cleared for United States marketing, and is particularly useful for patients with multiple conditions. But as noted previously, that's not all; Welch Allyn will also be showing off its mobile vital signs monitoring, or mVSM, system at the event. The mVSM allows for remote tracking of several critical vital sign measures, which can in turn help track and possibly prevent a number of adverse conditions that take place in hospitals from falls to pressure ulcers and beyond. The Connex Clinical Surveillance System is also on hand to provide better monitoring capabilities as well. That's a good lineup right there, and there will likely be plenty else on hand, just from Welch Allyn. What's more, there are likely dozens of other companies prepared to show things off at this event, showing that this is one field where there are plenty of competitors eager to show off. These competitors will have plenty to show, too, as each suggests a certain device can help monitor patients, provide information, or just improve a process to a degree that provides greater efficiency and from there cost savings as well. With the recent changes in healthcare law to encompass insurance and other matters, finding cost savings in the system can prove helpful. Every business wants to save money, and healthcare businesses are no exception. But saving money and still providing high-end service can be difficult, a difference that can be more readily split with the help of useful tools like those offered by Welch Allyn. Only time will tell just how well these work in the field, but Welch Allyn certainly has no shortage of solutions to try.